The world’s most popular soft drink is also the source of one of the world’s most popular collectibles – “Coca-Cola” items. Considering the longevity of this ubiquitous product, it’s no wonder that the famous “Coca-Cola” trademark is the most recognized trademark on the planet. “Doc” John Pemberton – who was not a doctor, but a druggist – was born in Knoxville, Georgia in 1833. In 1870, he moved to Atlanta with the dream of creating a successful tonic that would make him a millionaire. It was after the Civil War, and patent medicines were flourishing, elixirs that claimed to cure everything from indigestion to malaria. Pemberton had some success with a concoction called French Wine of Coca, an elixir he described as a “brain tonic”, something with restorative powers. Since his mixture contained sugar, red wine, and a powder from the coca leaf – from which cocaine is made – it’s popularity as a “pick me up” is understandable. Pemberton then turned his sights on creating a daytime “pick me up”. In 1885, he went into partnership with accountant Frank Robinson, and “Doc” began to develop his “whole body tonic”. Tincture of coca was a common ingredient in patent medicines, but Pemberton differentiated his new blend by adding an extract from the kola nut – an extract that turned out to be caffeine. He masked the bitterness of the two ingredients with a blend of spices and citrus flavourings. Robinson suggested the name “Coca-Cola” for the product, and it was he who developed the famous flowing letters of the trademark. The new drink, in the form of a syrup mixed with soda, debuted in the soda fountain at Jacobs’ Pharmacy on May 29, 1886. It was an instant success. Unfortunately, “Doc” Pemberton did not live to reap the rewards of his creation He died nearly penniless in 1888, having sold the formula for Coca-Cola for $1,200. Early innovations influence the way we view the product today. For example, initially the syrup was shipped in used, wooden whiskey barrels. Company owner Asa Candler ordered the barrels to be painted bright red, to disguise their “vulgar” origins. That “bright red” continues on Coke cans to this day. And, the distinctive “curved” shape of the Coke bottle was based on a mistake. In 1913, a bottling company in Indiana sent its accountant to the local library to gather information on the coca bean and kola nut. He returned with an intricate drawing of the curvaceous coca bean, and the bottle design was based on that. In actual fact, the drawing was of a “cocao” bean, not “coca”, and the famous bottle that was introduced in 1915 owes its style to this case of mistaken identity! “Coca-Cola” has understood the value of advertising right from the beginning. In fact, “Doc” Pemberton took out an ad in the Atlanta Journal to announce his new tonic the very day it first appeared at Jacobs’ soda fountain! Aside from print ads, the famous logo has appeared on glasses, food trays, blotters, thermometers, clocks, and so on, ad infinitum. All early advertising pieces are high ly collectible. Bottled “Coca-Cola” first appeared in 1899. Since that time, the Coke bottle has been through eight variations, and the examples from the turn of the century are rare and highly prized. 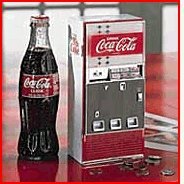 The company has a great Web site – www.coca-cola.com – where it offers current collectibles, such as the miniature vending machine radio pictured left. Sources: “Soda Pop!”, an excellent book by Gyvel Young-Witzel & Michael Karl Witzel, published by Raincoast Books, 1998 ; and the Coca-Cola Company. NOTICE – This site is not affiliated with Coca-Cola TM or Coke TM. 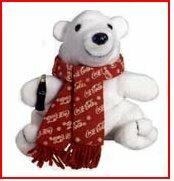 The purpose of these pages is to provide information to collectors of Coca-Cola Collectibles. Have you considered complementing your doll collection with picture postcards?